My son and I took a break from doing his homework (who gives homework over spring break, I ask you?) and adjourned to the shop. I wanted to make a handle for the brass head I made the other day. Kolya wanted to make one too, but I made him read me his English assignment first. Two birds, one stone. 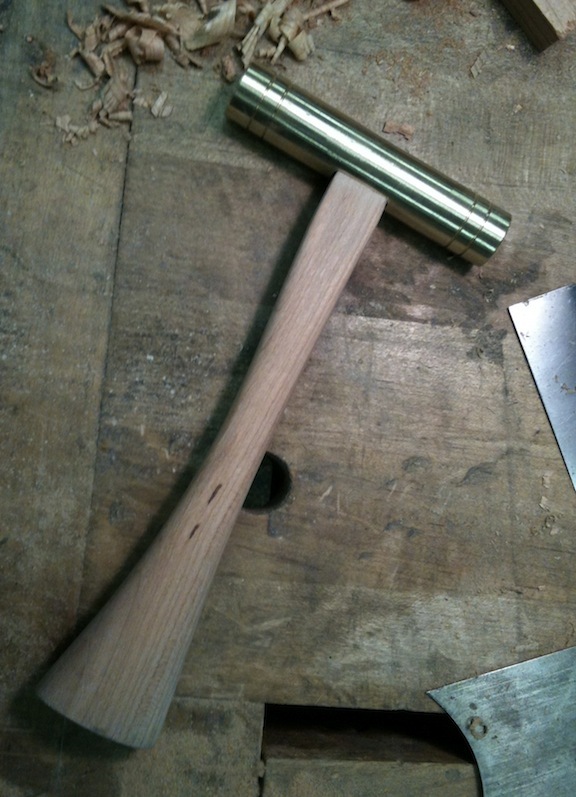 I’ve never made a hammer handle before, I’m sure the next one will be better. 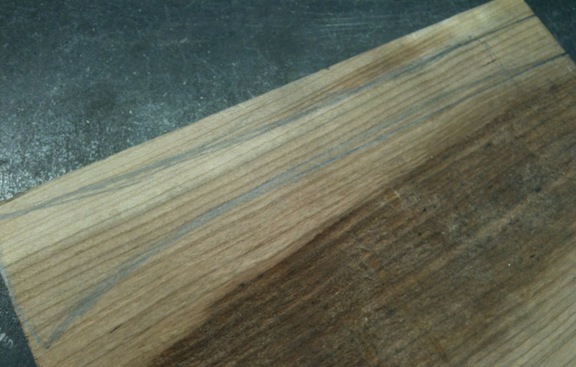 Basically I traced the hole in the head onto the end grain. This is a scrap of 6/4 Cherry I had. Then I sketched out the rough profile I wanted on the side, and cut it out with a coping saw. I had a spokeshave that I picked up years ago in my power tool days (and had never used). I sharpened the blade and used it to shape the handle I used a fine tooth rasp to sneak up on the fit of the handle into the head, and to blend the flats left from the spokeshave. Then I used a scraper to smooth it out and a quick once over with 220. I attached the head with a wedge (and yes, managed to split the wood slightly, damn it). A quick coat of stain and oil and I’m done. I’ll probably work more finish into the handle over the next few days, but it’s functional now. It was a fun project. After my son finished reading his English chapter to me he wanted to make a handle too. 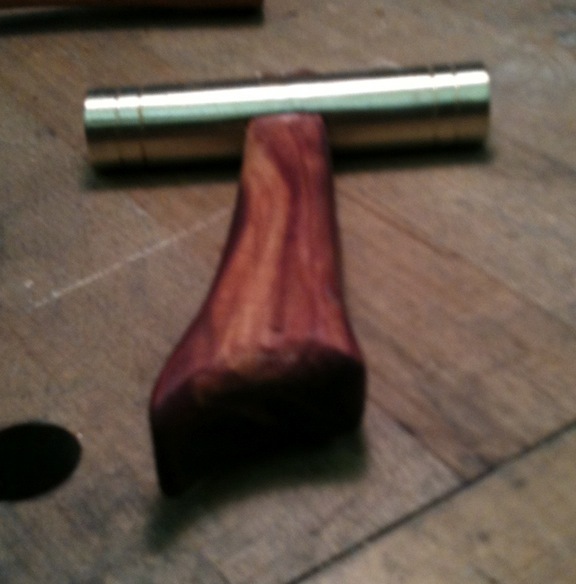 He used a piece of Easter Red Cedar that he picked out of the scrap bin at the lumberyard the last time we were there. He did it all himself with minimal coaching from yours truly. He took this picture too, choosing the angle to avoid showing the bit of handle that sticks out above the head. It was fun to hang out in the shop with him, and he even convinced me to take him to WIA in Pasadena in the fall. We’re registered, see you there! I’ve been collecting odds and ends to set up my metalworking lathe for woodturning. It shouldn’t be a big deal, but then I should know better than to say that. I had the design for a tool rest all planned out in my head. When I walked into the shop today I realized that the place where I was planning on mounting the tool rest was already at the centerline of the spindle…way too high. Rats. 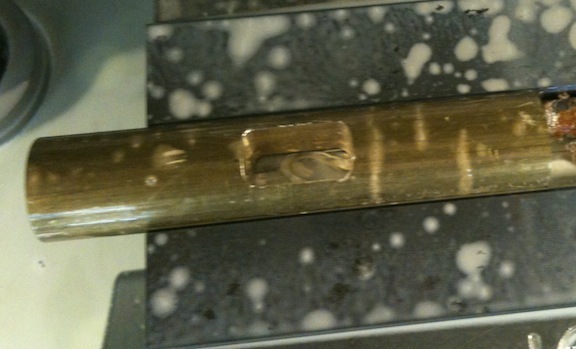 But while I was sweeping up the polishing debris I came across a piece of brass round bar stock. I have all sorts of metal odds and ends laying around. 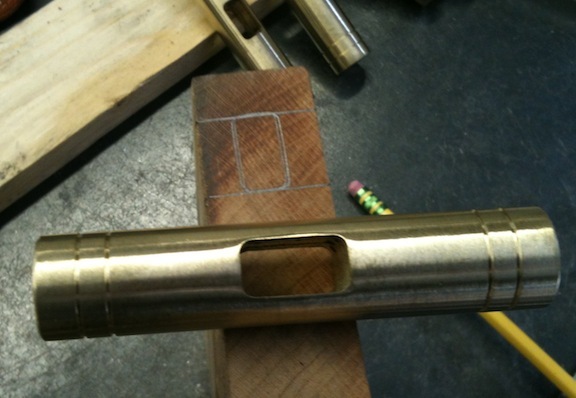 I’ve been wanting to make a little plane adjusting hammer, and lookie here I have a piece of brass in my hand. 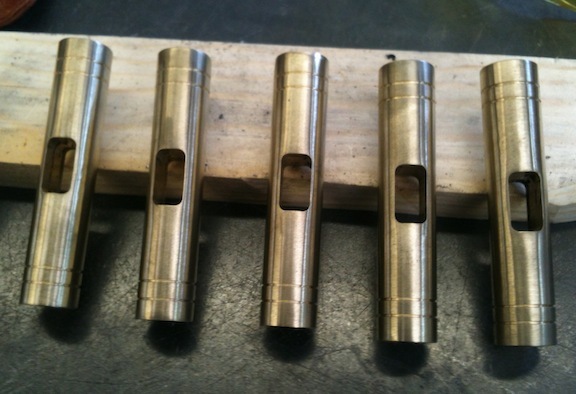 I started out by cutting the stock into 3.75″ long pieces in the cold saw. 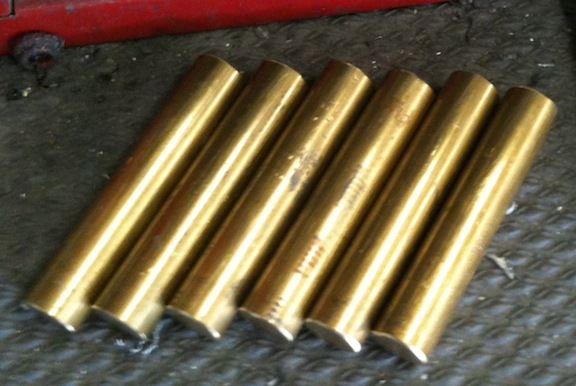 I wanted a finished length of 3.5″, plus a little extra to machine the ends square. I cut up all the stock I had, then cleaned it and de-burred the ends. 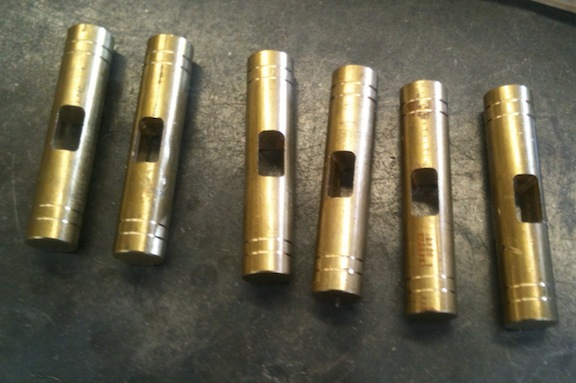 Making multiples of a part seems to a some sort of hangover from the chopper business – if I’m making one I might as well make a bunch. I’ll probably grow out of it eventually. 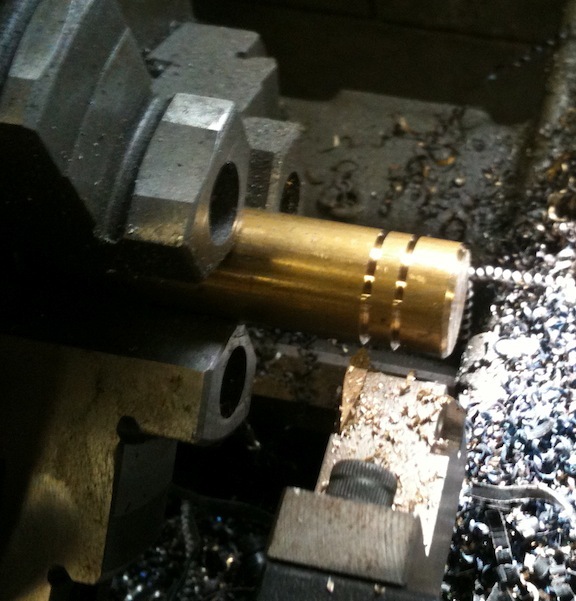 Then I programmed the mill to square one end, pause (so I could flip the part end-for-end) mill the other end square and machine a square hole in the middle. 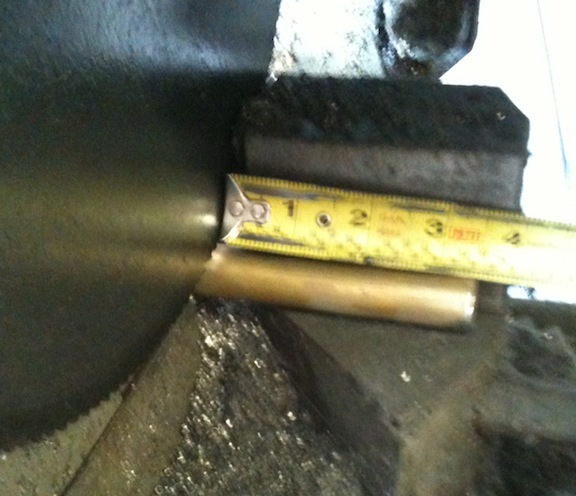 The hole is .400″ wide and .750″ long with radiused corners. 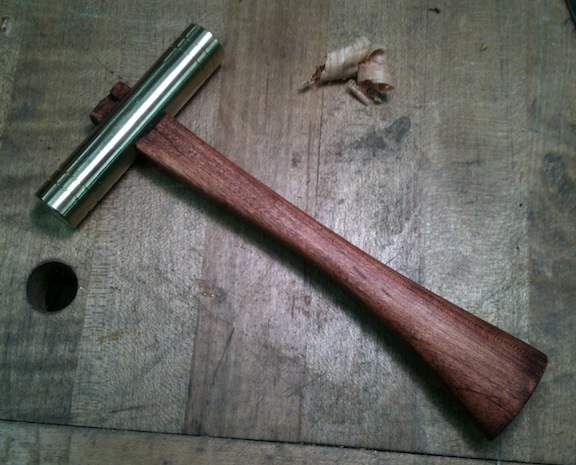 I have a book on making wooden planes that shows making an adjusting hammer by just drilling a hole for the handle. That would work too, this way there won’t be any chance of the head turning on the handle. 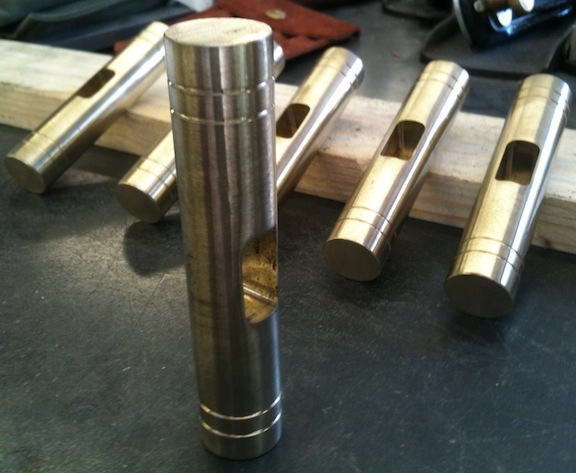 After milling the handle hole I chucked them up in my lathe, cut a small chamfer on the end and two decorative grooves. Nothing terribly precise, just eyeball engineering. The brass stock had a few dings from kicking around my shop for years, so I belt sanded it with an A65 3M Gatorback Trizact belt. I love those belts, they cut great (on metal) and have a really uniform grit. Huge timesavers when you’re making parts smooth and shiny. Then I hit the on a 600 grit cork belt with green chromium rouge. I wanted a fine satin finish, polished shows every fingerprint and nick. So now I just need to make a handle. Just one. I’ll give the extra heads away or something. Now to find a nice bit of wood to abuse into a handle.